On a blustery New Year’s Day four years ago, throngs of people in toques and jackets lined up in parking lots and on sidewalks across Colorado waiting for the end of prohibition. At 8 a.m., more than two dozen marijuana dispensaries opened their doors for recreational sales. By the end of the first week of sales, locals and tourists alike had reportedly spent US$5 million on weed. Advocates of Denver's first social cannabis use initiative haven't been shy about their disdain for the city's implementation of the voter-approved measure. After Initiative 300 won in November 2016, it took nearly a year for the city's task force to come up with regulations, and under those rules only one business has been approved so far. Undercover Denver police officers stopped two buses on Friday. Officers cited 31 people who were smoking during the ride on My420 and Colorado Cannabis tour buses. The marijuana industry in Colorado has grown quickly into a potent lobbying force at the Capitol. Marijuana businesses, law firms, consultants and trade organizations spent at least $720,000 on lobbyists during the 2018 legislative session that ran through May 9, according to an analysis by The Gazette. That was more than oil and gas ($530,000). It was more than grocery and liquor interests combined ($560,000). The sheer number of marijuana-related bills partly accounts for the big spending. Legislators and lobbyists tackled more than 30 affecting the marijuana and hemp industries. How Colorado should use tax revenue from recreational sales was a hot topic before marijuana was legalized. So was how to prevent youth consumption of cannabis. In fact, both are still hot topics, and now Denver will use a portion of the taxes collected by the city to fund marijuana prevention education in twenty after-school and summer programs around the city. 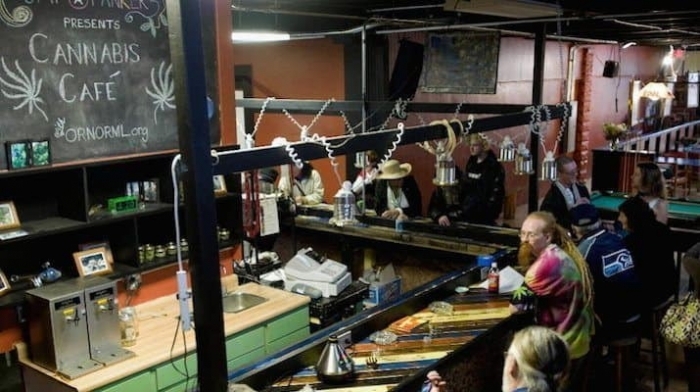 Colorado managed to get a bill all the way to Governor John Hickenlooper’s desk that would have allowed the licensing of public cannabis cafes where consumers could use small amounts of marijuana. The game-changing bill would have made Colorado the first state in the nation to have such a law. However, this week Hickenlooper vetoed it. The move further highlighted one of the most contentious battles in the marijuana industry—establishing laws that allow those who purchase marijuana to also consume it at specially licensed establishments. In September 2017, a group of friends announced their intention to apply for Denver's first social cannabis consumption license, with the goal of opening a pot-friendly gaming lounge. Although it took a little longer than expected, the group behind Denver Vape and Play finally turned in their application for a Cannabis Consumption Establishment license on Thursday, June 7.